Beautiful yellow flowers blushed with orange make this a garden must-have. Globes of golden-yellow, blushed flowers. Brightens dull borders and great in a container. Supplied as an established plant in a 2L pot. An award-winning Rhododendron which is deserving of a place in any garden. 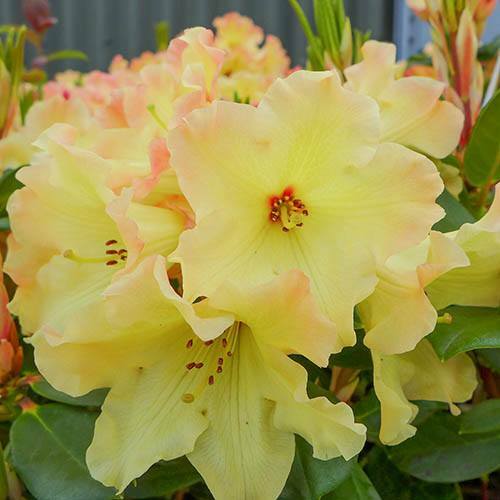 'Nancy Evans' (AGM) is a compact, evergreen Rhododendron with globes of golden-yellow flowers blushed orange which are definitely a sight to behold in late spring. We're delighted to bring you this absolute garden winner, and with the RHS Award of Garden Merit, you can be sure that it will perform. One of the better yellow varieties with colour all year round, even the leaves pack a punch with the young, bronze foliage becoming glossy green as it matures. A superb specimen for a large container or as a specimen plant in woodland borders or shady areas, when the luminous yellow flowers light up dappled shade and the glorious foliage provides the perfect contrasting backdrop for other bright flowers. Supplied as an established plant in a 2L pot, ready to plant out or pot on. Sometimes Rhododendrons can drop buds, or just refuse to flower. This is usually caused by a short period of dryness in the late summer months - so to prevent this, mulch plants and water deeply and regularly during dryer periods from July onwards. Rhododendrons with tolerate a more open site as long as they are sheltered from cold, drying winds and early morning sunlight. Your rhododendron should be planted slightly higher than it was in its pot into well-draining soil. Rhododendrons need an acidic soil with a pH of around 5.5 in order to thrive - soils with pH higher than 5.5 should be acidified before planting or you can grow them in a container with ericaceous compost.